A UNSW Sydney mathematician has helped solve a decades-old maths riddle that allows multiplication of huge numbers in a much faster time. 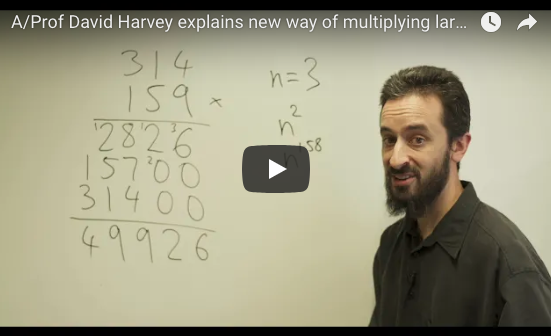 Associate Professor David Harvey, from UNSW’s School of Mathematics and Statistics, has developed a new method for multiplying together huge numbers, which is much faster than the familiar “long multiplication” method that we all learn at primary school. “More technically, we have proved a 1971 conjecture of Schönhage and Strassen about the complexity of integer multiplication,” A/Professor Harvey says. In other words, if we were to multiply the numbers 314 by 159 with the usual primary school method, we would need to calculate 9 digit-by-digit products (see video). In general, if n represents the number of digits in each number, the answer can be arrived at in n2 operations. A/Professor Harvey says that Schönhage and Strassen also predicted that n * log(n) is the ‘best possible’ result – that no-one will ever find a faster multiplication algorithm. While it’s still early days, A/Professor Harvey imagines that this breakthrough has an enormous number of consequences. A/Professor Harvey says he was surprised that such a fast multiplication algorithm is even possible. “People have been hunting for such an algorithm for almost 50 years. It was not a forgone conclusion that someone would eventually be successful. It might have turned out that Schönhage and Strassen were wrong, and that no such algorithm is possible. “But now we know better,” he says. The work was posted recently online at HAL.